Swapping wheels for different jobs or seasons can be a chore, but there is a range of devices on the market which can make the job easier and safer. Jane Carley explores a few options. The Mk2 Truecraft hydraulic wheel changer will lift wheels up to 1,800mm in diameter and 1,000mm wide, weighing up to 1,500kg. Features include a two-speed hydraulic ram for quick and accurate adjustment and a removable support handle to assist with manoeuvrability. Roller tables feature wide, 695mm long rollers for rotation of the wheel to align with the studs, and there is an additional castor wheel on the central frame support for extra strength. Sealey’s W1200T has eight adjustable rollers (four on each side) which allow for easy turning of deep tread tyres; a locking mechanism allows the rollers to be fixed at eight pre-set positions. A large jacking handle and hydraulic foot pedal allow for one-man operation. To ensure stability during transportation, a safety bar fits around the wheel. The W1200T is mounted on two locking and two non-locking castors for improved stability and manoeuvrability. Maximum wheel diameter is 2,200mm and maximum weight 1,200kg. Two models of wheel changer are offered by APM; TE950 and TE951. The higher capacity TE950 will lift up to 1,500kg and wheel diameters up to 2,150mm and widths to 1,050mm. Operated via a hydraulic foot pedal, the TE950 is mounted on 150mm diameter castors for ease of maneuverability. Two banks of large rollers are designed to offer improved handing for deep treaded tyres, while an adjustable safety bar keeps the wheel in balance. This model comes with a three-year warranty. 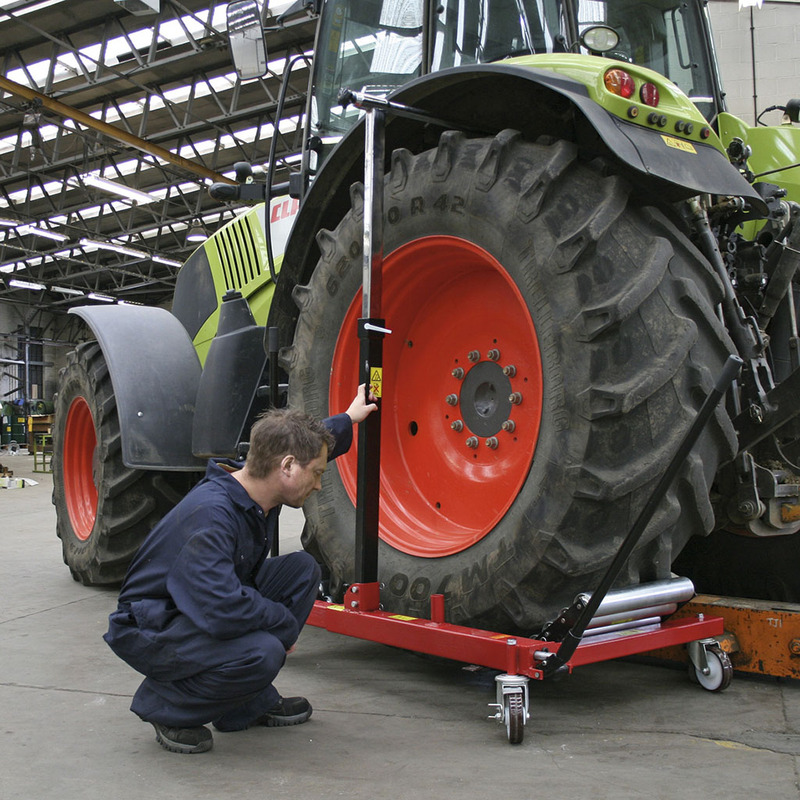 The smaller TE951 can lift wheels up to 1,200kg and 760mm wide. Prices are £1,495 for the TE950, and £695 for the TE951. Tyre specialist Moretons offers Craftsman and Liberator XL wheel lifter models. Both machines are operated by a two speed hydraulic ram. The ram first pulls the rollers towards each other on the higher speed. Once the rollers bear the weight of the tyre, the ram changes to the lower speed, offering more accurate height adjustment. Once the tyre is lifted off the ground it can be rotated on the roller bed to lineup with the wheel studs. An angled safety bar allows easy access to the wheel studs. Designed to lift up to 1,200kg, the wheel lifters are suitable for wheel diameters up to 2,000mm. The Craftsman 800 handles tyres up to 800mm wide, while the Liberator XL’s maximum tyre width is 1,200mm. Prices for the Craftsman 800 is £1,225 and £1,425.00 for the XL Liberator. 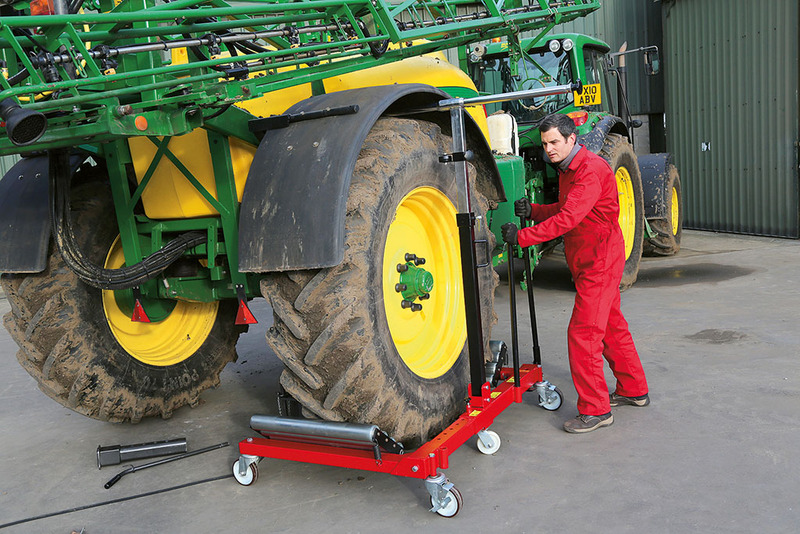 For something slightly different, Trakjak, designed by Irish contractor Pauric Fay, uses the tractor’s rear linkage to lift the rear axle off the ground, allowing wheels to be safely removed or changed. The rear linkage is connected to a frame which runs under the rear of the tractor. Raising the tractor’s lift arms pulls the frame against the pickup hitch and levers the tractor off the ground. 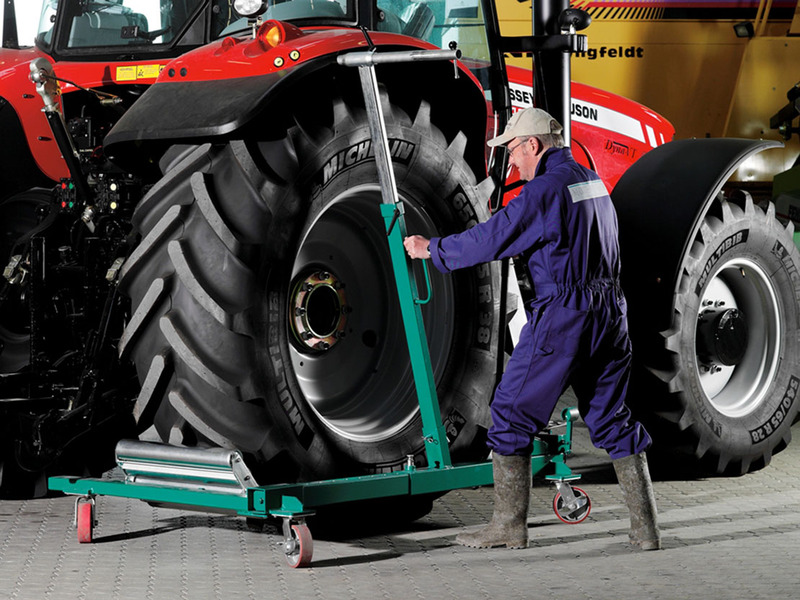 With the rear wheels removed, Trakjak’s solid wheels enable the tractor to be slowly maneuvered, with four-wheel drive engaged, from workshop to wash bay and vice-versa, making it easier to clean a tractor ahead of a strip-down or service. 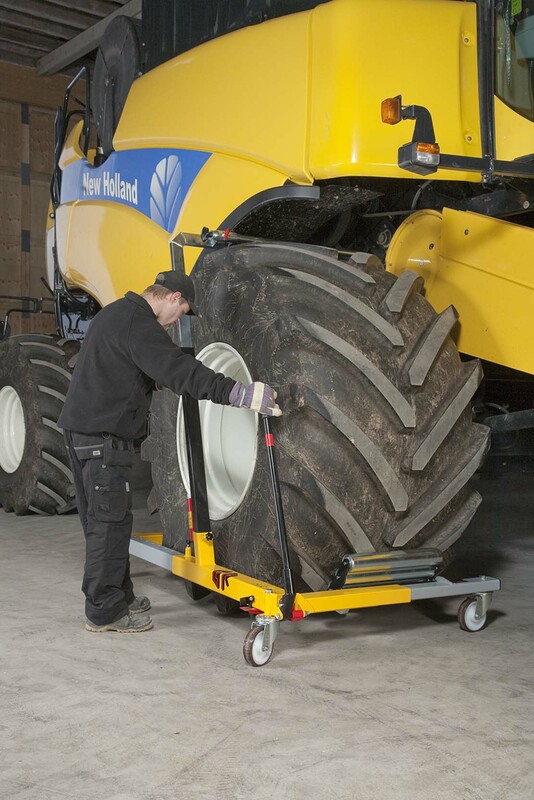 Trakjak can lift up to 12 tonnes, so is suitable for all agricultural tractors; the price is available on application.